EDIT: I have one further question about the build process. I managed it to build the cc-branch and the clanglib plugin against the cc-branch's source code, but starting (compiled) CB leads to the error message: "One or more plugin could not be loaded........clanglib.dll", because of missing symbols. Is there something more I have to do? From your LLVM/Clang installation, is 'libclang.dll' (some_path\LLVM\bin\libclang.dll) in the executable's searchable path? Yeah, that was it, stupid mistake of mine. Now I have a working build of CB which includes your plugin. It's so nice for me to see that there will be a working code completion for oglplus (C++ OpenGL wrapper), which seems to be a true nightmare for most existing code completion systems. 1. In my case there is a huge delay when loading a project (first parsing takes place) and when changing the current active file. Is that a normal behaviour at the current development status? 2. I like the dynamic checking of code validity, it's very nice integrated, although with some code it's rather confusing (a lot of warnings^^). Known problem. Currently, my development on this plugin has been mainly to try to explore the extent of possible functionality that clang provides. I have ignored performance... though, once I try to bring this plugin to more 'daily' use, the next steps will be to increase caching of results, and to move parsing to a separate thread, so as not to block the UI for so long (not done yet due to simplicity). I guess many are waiting for it. Not yet, but hopefully the code will be merge soon. Binary release available here for Windows, compatible with nightly build rev9765. Hi, Alpha, very nice work, I have just download both the nightly build and this clanglib binaries, the question is: How to use this plugin? Do I need to disable the normal cc plugin? 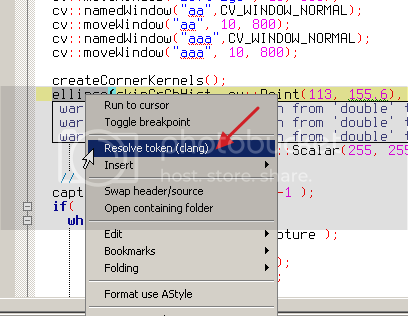 Q1: How to remove(hide) the tip window, see image shot below, do I need to hit some short-cut key? codeblocks.exe caused an Access Violation at location 62f86c09 in module libclang.dll Reading from location 00000014. Technically you probably should (because otherwise you are parsing everything twice), however, I do not. The two plugins seem to coexist nicely on my computer. Currently hardcoded to show warnings and errors, so I guess your two options are: fix the warning, or add -w to your compiler flags (restart C::B probably required). Or patch the plugin . Does this happen with any project? If it is a specific file, are you able to post a (minimal) code piece that will cause this crash? I have successfully compiled the ClangLib plugin but always crash at clang_getInclusions when they start to parse the project. Odd... Did you self-compile everything, or is this linking against a nightly? Compiled myself with TDM GCC 4.6.1, CB svn 9760, LLVM + Clang 3.3 and your ClangLib plugin. On small CB projects, ex. c++ Hello World it's working but on projects with wxWidgets always crash. Do you have a special build steps to compile LLVM with gcc on Windows? Oh, apologies; looks like I never got back to you on this. For Windows, I use the prebuilt LLVM/Clang (3.4), and TDM GCC 4.8.1 to compile wxWidgets and Code::Blocks. My guess from your crash is that clang_parseTranslationUnit() is returning null (which it will do in the case of internal errors so extreme, it cannot recover), and then the null is passed to clang_getInclusions(). Most likely, this is due to a compiler flag (and not your source code itself - clang seems fairly good at handling, or gracefully backing down, on any sort of code I have sent it). Could you post your full compile command line for the project that crashes? Okay, I believe clang is choking on "-finput-charset=ISO-8859-2", could you test: disable clang plugin, remove that build flag, enable clang plugin (probably need to restart C::B). 1- I had to disable the CC plugin to install the Clang plugin for the first time. CB crashed the first time after loading a project (CC plugin was enabled when I copied the files). After installation I could enable CC plugin. 2- I'm getting a ~1sec delay before the 1st and 3rd characters of anything I type on my old dual core cpu, will that delay be permanent? 4- I hope the argument tip comment for functions like 'some_func(/*! argument_type ! */)' will be optional as it doesn't play nice with my color profile. 5- I see the 'for', 'while' etc... are completed into complete blocks now and not just into keywords, is it possible to make this also optional? I use abbreviations plugin to customize these blocks.